A Torpedo Recovery Vessel of the Indian Navy sunk off the Visakhapatnam coast on Thursday during a naval exercise, killing one sailor while four others went missing. The Navy rescued 23 people and launched a search and rescue operation for the missing. At the time of the incident which occurred at 8pm, there were 28 personnel on board. "The vessel was on a routine mission to recover torpedoes fired by fleet ships during a routine exercise, when it experienced flooding in one of its compartments," the Navy said. "One sailor has lost his life during the rescue operation and four personnel are reported missing. 23 personnel have been rescued safely by the Search and Rescue (SAR) ships dispatched to the area," Navy said in a statement issued in Delhi. Navy officials said the flooding happened when the vessel was on its way back after collecting the "dummy" torpedo that was used in the exercise. "The incident happened within 10-15 kms off Vizag post," a Navy spokesperson said in Visakhapatnam. The boat sunk because of "some flooding", he said. 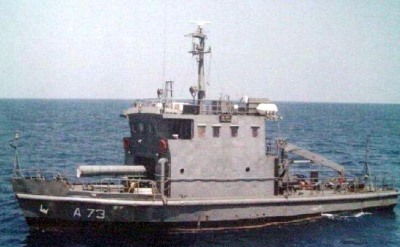 The Torpedo Recovery Vessel is an auxiliary vessel which is used to recover practice torpedoes fired by fleet ships and submarines. The ship, which is 23 meters long and 6.5 meters at the beam, was built by Goa Shipyard in 1983 and has served the Indian Navy for the last 31 years. The accident is one of the many that the Navy has witnessed over the last year. Navy chief Admiral R K Dhowan took over as the Chief of the Naval Staff on April 17 this year, after his predecessor D K Joshi quit following a series of accidents. Admiral Joshi's resignation came immediately after a fire on the INS Sindhuratna, which left two sailors dead. On October 31, INS Kora suffered minor damage after it was scraped by a merchant vessel near Visakhapatnam.